For many of the middle-aged and older, including myself, I suspect that the name "Fasch" is linked with that of "Pachelbel," as it was Fasch who occupied the flip side of Jean-François Paillard's famous record of the Pachelbel Canon. Now that we are in the CD era – make that the mp3 era – the concept of a "flip side" is foreign to younger listeners. What chance does a composer like Johann Friedrich Fasch have in a world like ours? It turns out that he has a pretty good one. I was surprised to see how many all-Fasch recordings are available from Amazon.com, for example. He was born in 1688, just three years after Bach and Handel, and outlived both of them. Stylistically, the works on this CD most resemble those of Telemann, and he seems to have been about as prolific as his countryman, and as varied in his choice of genres. Fasch's output contains vocal music – masses, and dozens of cantatas, for example – but he composed even more instrumental music. These include chamber works, orchestral suites, concertos, and, in anticipation of the Classical era, a number of symphonies. Chandos and Tempesta di Mare claim "world première recording" status for the music on this CD. Apparently much of Fasch's music was lost or destroyed during the bombing of Dresden in World War Two, and the works presented here are among those that have been reclaimed or restored from the Dresden collection. The Ouverture grosso is an orchestral suite not unlike those of Bach, including a grand French-style Ouverture to open the work, and a series of dances to carry it along. Even at its grandest, the music is unfailingly ingratiating. The graceful Concerto in B flat is more like a concerto grosso, because Fasch treats the wind instruments as concertino group, alternating between them and the full ensemble. Fasch does something similar in the D-major concerto too. The CD concludes with an alternative version of the middle movement from this last concerto. What makes Fasch's music most enjoyable is his willingness to dance. Try the final movement of the Concerto in D and see if its bubbling nature doesn't make you want to move. 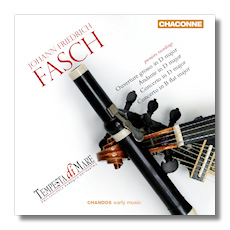 While Tempesta di Mare gives Fasch's grander moments their due, its members also seem to be inspired by Terpsichore, so a good time is had by all. The playing is suave and, while it is solid, it is not at all heavy. Tempesta di Mare is a Philadelphia-based ensemble. This is the first time I've encountered this group's work. Tempesta di Mare is definitely at least as good a reason as the Liberty Bell to visit the City of Brotherly Love!